The Epson Stylus Pro 4880, introduced in 2005 and now discontinued, is a professional-level photo printer designed to support high-resolution prints and large-format image reproduction. Given that this printer is now half a decade old, it has a number of issues that have been improved or resolved in later models across the same Epson line. The printer measures 33" by 14" by 30" and weighs 89 lbs. Later revisions weigh considerably less than this and are significantly smaller, making them more portable and easier to place in spaces that already have large quantities of equipment, which has the potential to be an issue with this model given that it cannot meet the needs of an environment that also requires a high throughput of lower-quality prints. 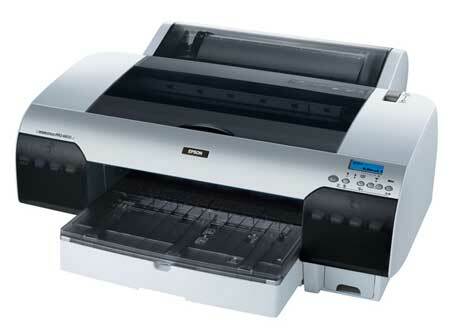 The printer produces images at a minimum resolution of 360 by 360 dpi and a maximum of 2880 by 1440 dpi, consistent with other printers in the Stylus Pro line. Its smallest ink droplet size is also 3.5 picoliters, again similar to other Stylus Pros. The Pro 4880's print speeds are measured based on the time necessary to produce prints at various measurements, though this is variable given the levels of detail and how much toner is necessary to produce them. 8" by 10" prints can be produced between 1:18 and 6:25 with a normal speed of 2 minutes; 11" by 14" prints can be made in times between 2:27 and 10:55 with 3:25 as an average, and 16" by 20" prints can be made in between 4:07 and 18:57, with 6:07 standard. The Pro 4880 can print borderlessly onto rolls measured at 8.25", 8.5", 10", 12", 13", 14", 16", and 17" wide, with 17" as the printer's maximum paper width and 132 feet as the printer's absolute longest roll length. Its input tray can process documents up to 17" by 122" and its media input tray can support up to 250 sheets, half a ream of paper. Furthermore, the printer can print on 2" and 3"-cored media, not available on lower-end Stylus Pro models or consumer-grade inkjets. The Pro 4880 includes one USB 2.0 port and one 10/100Base-T Ethernet port, allowing for easy networking or high-speed individual use. There are three variants of the Pro 4880: the standard 4880, the ColorBurst Edition, and the Portrait Edition, though this only affects what software is included with the printer. The ColorBurst Edition includes ColorBurst RIP and the Portrait Edition includes ExpressDigital Portrait and Wedding Workflow. 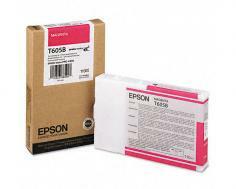 User-replaceable components for the printer include the ink maintenance tank and the printer's cutter blade, adding to long-term maintenance costs atop ink purchases. The Pro 4880 lacks some of the conveniences Epson offers on newer printers, such as integrated wireless networking and built-in memory card readers. Users complain that loading many different-sized sheets into the Pro 4880 can be a frustrating process, as the printer regularly gives errors about improperly loaded paper, making it hard to recommend for applications in which the printer regularly has its paper type changed. As with all Epson printers, a USB cable is not included. This is more of a minor inconvenience than a con, but do know that if planning to connect the Pro 4880 via USB that a separate cable will be needed. Review it: "Epson Stylus Pro 4880 "
The Pro 4880, like other models in Epson's Pro line, has a number of consumable components. Ink cartridges are measured in yields of either 110 or 220 ml and there are many of them to ensure maximum-quality prints. Color cartridges are cyan, magenta, yellow, light cyan, and light magenta. Photo black, light black, matte black, and light light black are also required, as is a maintenance cartridge, which contains the printheads and must be replaced when they are worn out as indicated by the printer's drivers. Wear and ink use will vary based on the size of prints and detail levels involved. Furthermore, the matte black and photo black cartridges must be manually swapped when working on either photo jobs or non-imaging work.